This is a new experiment, I'm reading the just delivered July's Gourmet Magazine and I will post random thoughts while I peruse the magazine. I should be okay looking at the food photos, I just ate a salami sandwich and Kosher pickle to help deflect immense hunger. The cover picture is a delicious looking steak with roasted baby and pear tomatoes. Looked so good I went to the freezer to see how many New York strips steaks I have left. Only one and two of us- damn. Great picture of Martin Yan, from the very early food cooking show Yan Can Cook promoting Merrill Lynch. The contents page photo is eye-catching of a house on a river. Content page two had a recipe for Sweet Ricotta Pudding with Roasted Grapes, looks way good and quite simple; I’ve folded the edge over to remember the page. Ooh no, not Ms Perky, the Regis Philbin sidekick, who is promoting the heck out of Electrolux appliance. I doubt she ever touches a sauté pan in real life. Still on table of contents page 3 and they are featuring the new Gourmet Test Kitchen videos (here’s the link http://www.gourmet.com/food/testkitchen). There’s a picture of Emeril promoting his pots and pans. I can’t remember where I read a story recently where someone tested all the celeb pots and pans - Emeril’s came out favorably. Okay, I’m at the Letters and You Asked for It Column. Someone wanted a recipe for sweet-and-sour crab salad. As I look at it the dressing is unseasoned rice wine vinegar, sugar, garlic and chili pepper flakes. They call for crab legs, cabbage, cucumbers and fresh herbs…didn’t bother to turn down the corner of the page. Ooooh, ooh – yummy photo of a burger with a poached egg, beets and slice pineapple….have to skip to page 36 to read the recipe. It is called an Aussie Berger. I have folded the corner down on this. The salami sandwich isn’t cutting it now. A blurb on the New classic duck fat fries. I wonder what they would be like if fried in schmaltz (rendered chicken fat)? Skipping the review of a restaurant in LA – won’t be in LA anytime soon unless I do a stage (pronounced staw aage) internship with a food styling company. Jan and Michael Stern’s review in the Roadfood column I will read that another day. More restaurant listing for LA, Culver City….pass. Promo for the Gourmet Institute in New York – October 17-19th. If I had the extra dollars, would love to do this but alas I needed two crowns and filling. Hint, hint Gourmet, treat me and I will live blog the event. Good Living Cooking column – Book review, Beyond the Great Wall by the award winning cookbook authors Jeffrey Alford and Naomi Duguid. I just received an article from the Washington Post about the Eye-Watering Taste of Bhutan’s Unique Cuisine being featured at the Smithsonian’s Folklife Festival. It seems Yak is featured in both. Who is raising yaks in Baltimore? Anyone know? Buy local! Debunking the don’t wash your mushrooms…Gourmet says go ahead and wash them – doesn’t matter, they are about 90 percent water to begin with. There is a story on M.F.K. Fisher, inspired by what would be her 100th birthday in August. Postpone reading it for now. Whoa Hoo – Goat, the next new red meat. Pass on that story-I’ll get back to it. The science column----The Corrections is all about how everything we know about taste is wrong. Great column, I read the whole thing and will come back to it again. Corner of the page is folded. Another picture of steak…a definite run to the food store after I pick up my prescription. Quick look at the Quick Kitchen column …nothing eye catching. Picture of the Zucchini-Basil soup looks good, simple preparation though I’m not sure I will fix it. Interesting recipe, Cantaloupe with Coulis, you take the seeds and some juicy center section of the cantaloupe, using a blender, combine them with sugar and lemon juice and strain it. Serve it with the cut melon slices. Yup, that edge of the page is turned under. Gourmet Entertains…lost me with the pictures of the skinny young folk in the bathing suits. Gourmet Travels…ooh, an article by my namesake, Dara Moskowitz, who lives in Minnesota. I’ll come back to this later. A story on Beijing and the Olympics. I have to come back to this. I’m falling behind in real work. There is a great list of recipes using fresh herbs. Excuse me, ripping out that annoying cardboard piece for Gourmet subscriptions. Five chefs mention their favorite herbs. 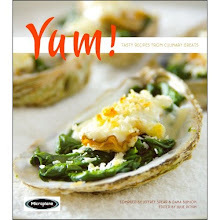 Okay, one is David Myers from Sona in LA, he donated a recipe for my cookbook compilation. Damn, his favorite herb is shiso. Shiso is impossible to find here in Baltimore. Do any of you know where to find it? I can’t find it at the Asian stores. Jerry Traunfeld, the chef from the Herbfarm near Seattle had to bring it in with him when promoting his cookbook. There was none to be found here and I needed it when styling for him. On the article called Big Love, about our summer love with tomatoes. Here are the recipe titles: Tomato Bread Pudding, Tomato Risotto, Heirloom-Tomato Terrine, Sherry Tomato Granita (folding corner down), Porterhouse Steak with Pan-Seared tomatoes (cover shot I talked about earlier. ), Green-Tomato and Honeydew Melon Salad. Cool beans..no, cool tomatoes: a market guide of photos of the different types of tomatoes. The grand finale, The Last Touch column on at final page, I love this column; they pick a single ingredient and list recipes. They discontinued this column at one point and so many people complained, it was added back. OK, this month it is parsley. It’s a wrap. Go buy your own July copy of Gourmet and let me know what you like. Off to the food store. You guessed it, steak for dinner. That's a good idea - live blogging is so fun. Although doing it to a magazine makes it more leisurely to do so! That Last Touch thing sounds like a great idea, too. How fun! Thanks for the live blog. I googled "internship at Gourmet magazine" and you popped up. Thanks for the great read and have a wonderful weekend!